Micha Thau is a senior at the Shalhevet High School in Los Angeles, and is a gay orthodox Jewish teen. 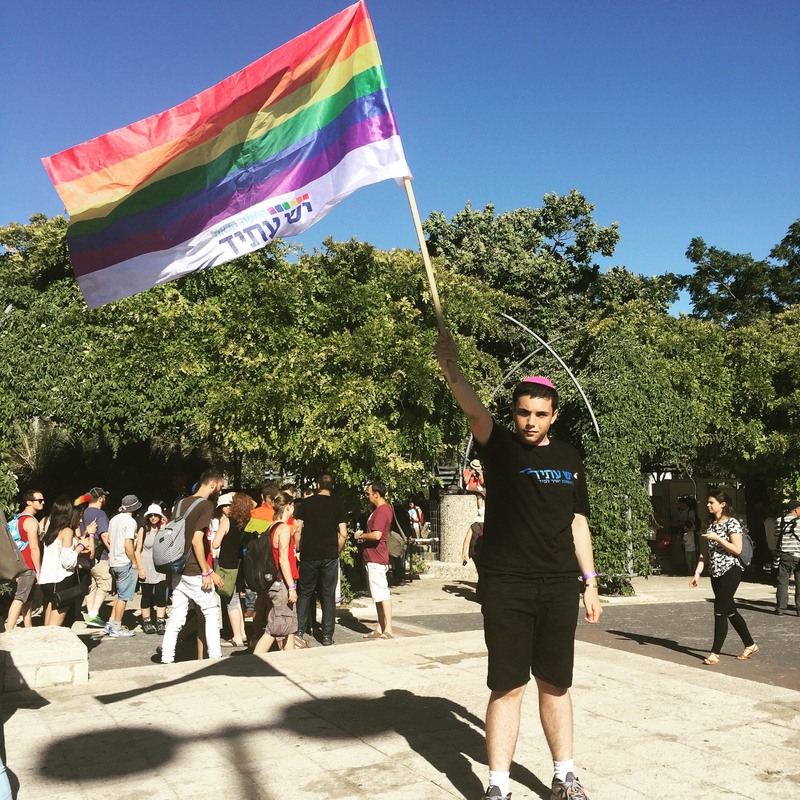 Through his internship at Eshel, an organization which works to create community and acceptance for LGBTQ Jews and their families in Orthodox communities, he took JOIN’s online course, Don’t Kvetch, Organize! Upon completion of this course, he decided to create “The Pledge” which includes a series of promises Jewish high schools can take to protect gay and lesbian students. The Pledge was released during the past High Holidays in Fall 2016. Why do you feel passionate about LGBTQ issues in an orthodox context? I acted on this cause, of advocating for the rights of LGBTQ orthodox Jews, because of my experience coming up in my Jewish orthodox high school. It was torturous to be in the closet, to not know that if I came out I would be accepted at my school. I was so worried. When I finally took the leap, I saw that my school was in fact supportive. I thought, “Why should I have had to go through all that torture if I could have been happy my entire high school career?” It was not fair that I had to question whether I would be accepted, and I have become passionate about making it so others don’t have to go through what I went through. No one deserves to be in fear that their school won’t accept them, because coming out isn’t about your school or shul – it’s about finding yourself and finding a part of your identity. By creating The Pledge, a series of promises that Jewish schools can sign in order to create a protected environment for all students, I’m trying to prevent others from going through the fear that I went through. Last year, a teacher recommended that I get in touch with Rabbi Steve Greenberg at Eshel, an organization which works to create community and acceptance for LGBTQ Jews and their families in Orthodox communities. I ended up working for them as an intern starting in the winter of 2015. They told me I should take JOIN’s online course in spring 2016 to learn how to organize, and then I could create my own initiative to better the Jewish orthodox world. After taking Don’t Kvetch, Organize!, and through my internship at Eshel, I decided that my summer project would be to create a pledge for orthodox schools to sign to be public about their acceptance of gay and lesbian students. Last July (2016), I approached the school administration to share that while I felt accepted, I would have come out earlier if I had known how the school felt about this issue. I told them I was going to create this pledge, and asked if they would be open to signing it. Instead of just saying yes, they said that they wanted to partner with me, and it ended up being incredible working with Rabbi Ari Segal (the head of school) and Noam Weissman (the principal). We worked with Eshel, who has experience navigating the difficult world of policy, donors, and religion when working on LGBTQ rights in the orthodox world. Together we came up with the six points of the pledge, points that would make students comfortable without pushing religious lines, since we want this to be something that orthodox schools would be comfortable signing on to. And we are clear that if a school isn’t comfortable with the whole thing, they can adopt a modified version. Even if it’s just one thing, it can ease the anxiety of students. We want this to support students in feeling comfortable in their identity, and prevent them from being subjected to fear. Were these key lessons about organizing from Don’t Kvetch, Organize! that supported you work on this project? The course provided a lot of context about how to best approach an initiative that can seem controversial, and provided tools to tackle difficult problems. It gave me an education about how to advance this cause. A big lesson was about relationships – how important they are (especially with people in power), and that it’s important to work with others even if we aren’t 100% on the same page, and even if we have to compromise. Was there a moment that felt particularly powerful during this work? What felt most powerful for me was when the article that I wrote was published in the Jewish Journal. It generated a lot of comments and really humanized the issue for a lot of people. The greatest and most rewarding aspect was people coming up to me saying I have a gay son, or lesbian daughter, and sharing how appreciative and happy they were that I had brought this to their attention. Some people shared that they didn’t understand this issue before, but now they did. I received so much empathy and support, and was happy I could contribute to the orthodox community in this way. Where’s the project now, and where do you hope it will go? We worked on The Pledge over the summer, and went public this past fall (2016). Currently my school is the only one that has signed on, but we are preparing to do a bigger outreach effort in the next couple of months. What would be most successful is if we got orthodox schools nation-wide to sign this, like 20-30 schools. I think that the future of the Jewish community is kids, children, people like me, not the people making decisions right now. I see this as a stepping stone for making change in the future. How have you grown during this process? By being an advocate and ally, I’ve come to find myself and to become more comfortable with my sexuality – the way I feel about being a gay Jew has entirely changed as I’ve become more active. When I’m fighting for myself and others on the assumption that everyone is equal, I realized in that process that I should see myself as equal. You can read Micha’s article in the Jewish Journal here, and access The Pledge here. This entry was posted in Alumni At Large, From the Field, General, Success Stories. Bookmark the permalink.